Please check back regularly for new events and updates! The events below are listed in chronological order from the bottom. If you have an event you’d like to add to the calendar, please contact us. We publish events hosted or sponsored by our Network partners, and events of general interest to supporters of strong public schools. Note: An I love my public school logo indicates a Wisconsin Public Education Network-sponsored event, meeting, or action. STATE BUDGET HEARINGS — times and dates TBA. Stay tuned for action opportunities and keep your eyes open for news of listening sessions hosted by your own legislators! Thursday, April 4: A Time for Action: School Funding Report Forum with Green Bay Superintendent Michelle Langenfeld; Milwaukee Public Schools’ Legislative Policy Manager, Chris Thiel and WI Public Education Network’s Heather DuBois Bourenane, Green Bay. Sponsored by the Green Bay League of Women Voters. Thursday April 4: How Will the State Budget Affect Our Public Schools? A Budget Forum with Dr. Julie Underwood and Dr. Phil Ertl, sponsored by SOS-Support Our Schools Wauwatosa. Tues. April 2: SPRING ELECTION. Early (in person absentee) voting going on NOW. 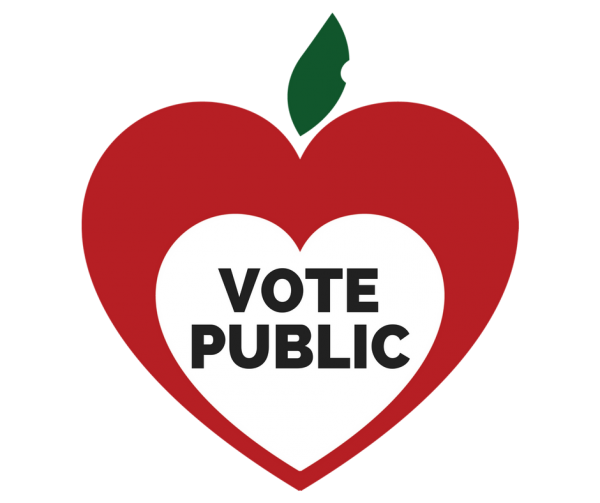 Local advocacy teams are holding candidate forums around the state – make sure you get informed and cast a vote for local candidates that support strong public schools! Wed. March 14: Eat, Drink & Be the Change! A fun social event with “speed dating” to get to know each other and practice sharing our reasons for budget advocacy, plus planning time for Dane County advocates (all issues welcome). RSVP here. Feb. 11-15, 2019: 3rd Annual #ILoveOurPublicSchools Week. 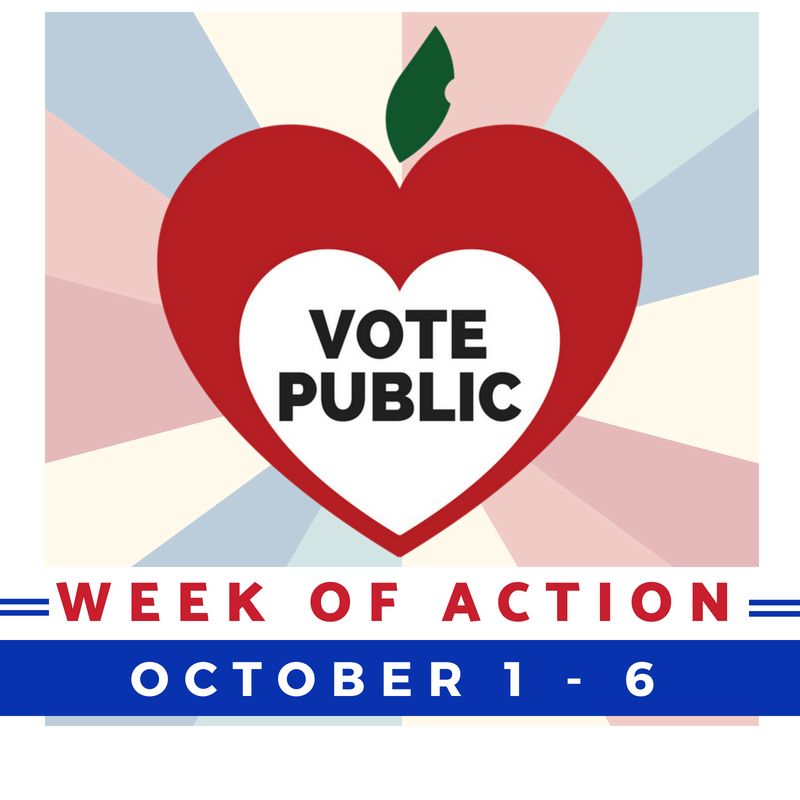 See our toolkit here and plan to celebrate local schools all week long! Join us from 4:30-6:30 on Thursday Jan. 24 for a #GoPublic Happy Hour in the Monarch Lounge at the Hilton, and stop by the exhibition hall any time to visit us in booth 1124! December 11, 4:30PM-6:00PM: Green Bay, University of Wisconsin Green Bay, Phoenix Room. 2420 Nicolet Dr, Green Bay, WI 54311. Register for Green Bay session at this Green Bay link. December 12, 12:00PM-1:30PM: Wausau, Wausau Labor Temple. 318 South Third Avenue, Wausau, WI 54401. Register for the Wausau session at this Wausau link. December 18, 12:00PM-1:30PM: La Crosse, American Legion Post 52. 711 6th St South, La Crosse, WI 54601. Register for the La Crosse session at this La Crosse link. December 19, 4:30PM-6:00PM: Milwaukee, United Way of Greater Milwaukee and Waukesha County Volunteer Center. 200 West Pleasant Street, Milwaukee, WI 53212. Register for the Milwaukee session at this Milwaukee link. Let’s not miss our chance to participate in these events and share our priorities for what our students and schools need most! Dec. 19, 9am, WI State Capitol: Final (?) meeting of Blue Ribbon Commission on School Funding No public input will be heard. The Commission will meet to finalize recommendations on school funding after a year of meetings and hearings held around the state. See our Blue Ribbon HQ page for more info. Dec. 7: Wisconsin Public Education Network meeting (3-5pm) and Winter Social (5-7), 33 Nob Hill, Madison. With very special guests Lieutenant Governor-elect Mandela Barnes, Treasurer-elect Sarah Godlewski and DPI Communications Director Tom McCarthy. Nov. 13: Public Schools & Democracy: A Community Conversation with Dr. Julie Mead. Sun Prairie Public Library, 6:30-8 pm. Cosponsored by SPARC and the Sun Prairie Public Library. Nov. 6: Election Day. Polls open 7am to 8pm statewide. Visit Wisconsin Vote to learn more, and MyVote.wi.gov to register, find your polling place, and see a sample ballot. In-person absentee voting takes place starting Sept. 24 (check with your local clerk for hours). Visit our Vote Public HQ ​for more. Oct. 29-30: Wisconsin Rural Schools Alliance annual conference, Wisconsin Dells. WPEN will be presenting! Come say hi! Oct 25: What’s Next for Our Public Schools? Legislators Talk Strategy. 6:30-8pm, Christ Presbyterian Church, Madison. This forum with area legislators is co-hosted by Wisconsin Public Education Network, GRUMPS (Grandparents United for Madison Public Schools), and MTI. Facebook event here. Sept. 25: Free Screening: Backpack Full of Cash, Racine, featuring opening remarks by WPEN director Heather DuBois Bourenane. Co-hosted by REA-Unity. Sept. 22: Wisconsin Grassroots Festival Eau Claire. One of the featured keynotes is WPEN partner and education advocate Sheila Plotkin! 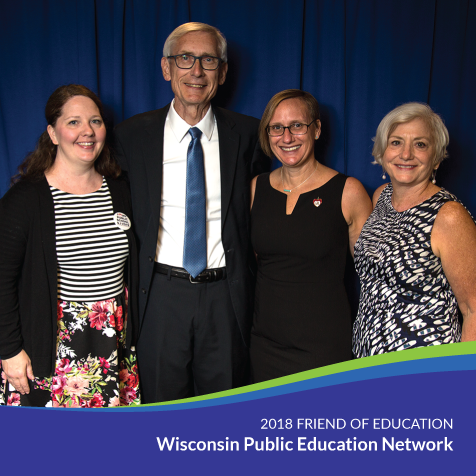 Sept. 20: State of Education Address (12-1) and Wisconsin Public Education Network Friend of Education Reception (1-2) and meeting (2-3:30). RSVP here. Facebook event here. June 4, Blue Ribbon Commission on School Funding, Madison. RSVP here. Monday, May 21 Blue Ribbon Commission on School Funding Public Hearing: Turtle Lake. RSVP here. 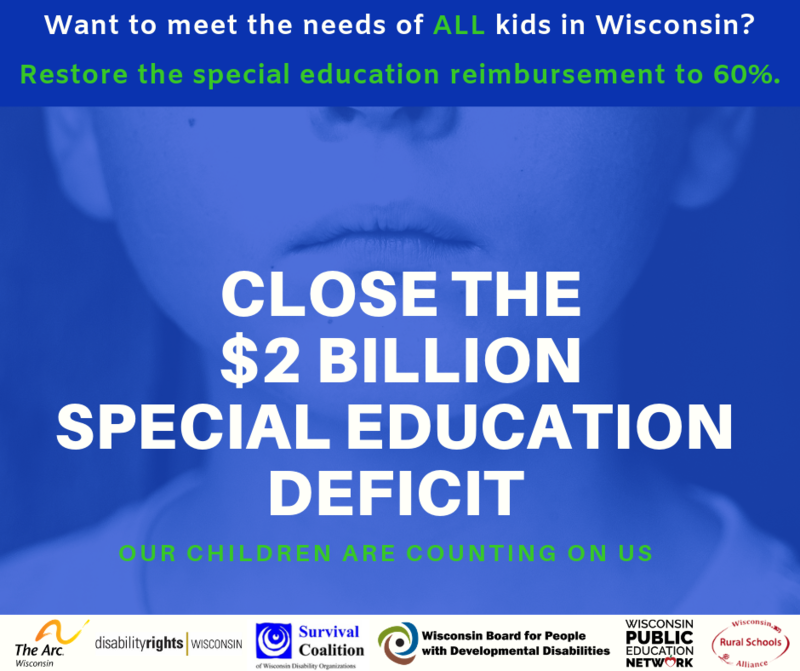 May 11, Wisconsin Public Education Network meeting, Milwaukee (hosted by Parents for Public Schools-Milwaukee) RSVP here. Monday, May 7 Blue Ribbon Commission on School Funding Public Hearing: Tomahawk. RSVP here. Wednesday May 2: Screening of “Backpack Full of Cash” – 6:30 p.m. in the auditorium at Greendale High School, 6801 Southway, Greendale, with Tim Slekar, Jeff Pertl and Jim Bender on the panel. Sponsored by Greendale Education Association. More info here. April 27-29, Wisconsin PTA Annual Convention, Janesville Ramada. April 27: FILM SCREENING: The brand-new advocacy team, Coulee Region Public Education Network, plans to launch its kickoff event with a free screening of “Backpacks Full of Cash” on Friday, April 27 at 7pm at the Rivoli Theatre in La Crosse. April 26: The Manitowoc League of Women Voters is sponsoring a talk on Thursday, April 26: “The Cost of School Vouchers: Who is paying the price?” with WPEN’s Heather DuBois Bourenane; Mark Holzman, Manitowoc Public School District Superintendent; and Lisa Quistorf, Two Rivers School District Superintendent. April 23 Blue Ribbon Commission on School Funding Public Hearing: Oshkosh. RSVP here. April 13, Wisconsin Public Education Network meeting, Green Bay (hosted by the Green Bay League of Women Voters) RSVP here. FILM SCREENING: Community Advocates 4 Public Schools (CAPS) in Watertown is hosting a FREE screening of Backpack Full of Cash on Wed. April 11 at the Towne Cinema in Watertown. April 9, Blue Ribbon Commission on School Funding Public Hearing: Fennimore. RSVP here. March 26, Public Hearing: Blue Ribbon Commission on School Funding 2:00 PM, Foth, 2121 Innovation Court De Pere, WI 54115. Click here to RSVP. March 16, Wisconsin Public Education Network meeting, Sun Prairie, 10-noon. RSVP here. March 5, Blue Ribbon Commission on School Funding Public Hearing, Lacrosse, 1pm-6pm. RSVP and Details. Feb. 14: Wisconsin PTA (Parent Teacher Association) Legislative Conference. 9am-2pm, Wisconsin State Capitol, 2nd Floor North Hearing Room. Facebook event here. Speakers include Rep. Jeremy Thiesfeldt and Wisconsin Public Education Network’s Heather DuBois Bourenane. Feb. 12, Wisconsin Public Education Network meeting and I Love My Public Schools week kickoff event, hosted by CAPE Middleton, 12:30-2:30, Middleton Public Library. CLICK HERE TO RSVP FOR FEB. 12 MEETING. I MY PUBLIC SCHOOLS WEEK, February 12-16 Stayed tuned for action events for this week. Feb 2: meeting of Blue Ribbon Commission on School Funding. Public testimony opportunity. 10:30 am to 4 pm at the James Madison Academic Campus, 8135 W. Florist Ave, Milwaukee. (See map.) Click here to RSVP with WPEN and connect with others who plan to testify. Jan. 27: Educators Amplified: What Does Accountability Really Mean? 12-3pm, Cactus Club, Bayview, WI, 2496 S. Wentworth Ave. Cosponsored by Schools and Communities Unites and WEAC Region 7. Featuring Earl Ingraham and Tim Slekar. WPEN Partner Meeting, January 12th. 1 pm – 3 pm, Kaukauna Public Library. Please RSVP here. Followed by the first Summer Summit Planning Meeting. 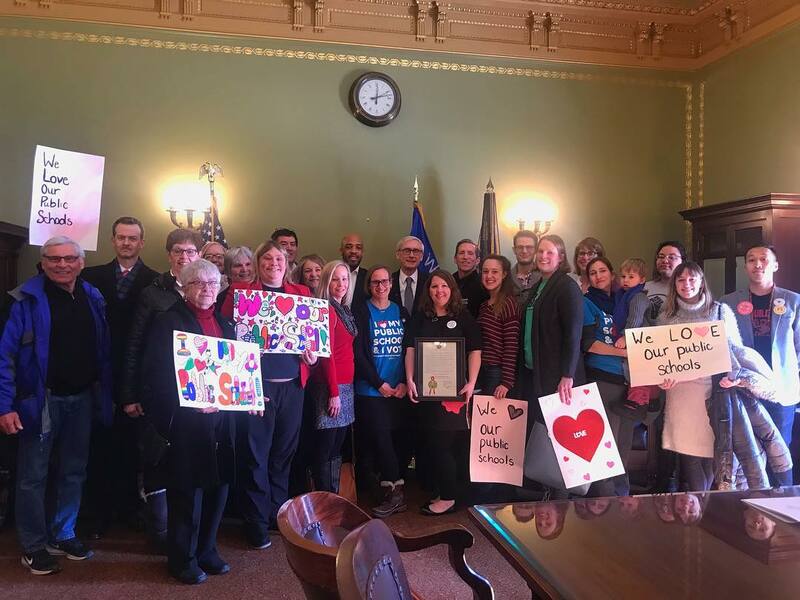 Jan. 11, hearing on “Teacher Protection Act” – a bill uniformly opposed by WPEN partners and public education advocates. Testify in person Thu. Jan. 11, 9:00 AM North Hearing Room (2nd Floor North) (testimony will likely be limited to 2 minutes) or via email by sending written testimony or a statement of opposition to Rep.OttJ@legis.wisconsin.gov as well as to your own legislators. Find your legislators’ contact information at http://legis.wisconsin.gov. A press conference organized by Disability Rights Wisconsin begins at 8:30 am. Please join them by 8:15 in 415 NW to participate. All are welcome. 318 S 3rd Ave. – Wausau, WI. Features panel, WPEN Smart Education, with Jeff Leverich and David Gorski. How can Dane County communities deal with declining financial support, changing demographics, and attacks on the concept of public education? June 27, 1 to 3 p.m. — Lussier Community Education Center, 55 South Gammon Road, Community Room, Madison. Sat. May 13, 1-3 pm. Merrill. School Voucher Information Presentation. As a result of education reforms coming out of the state legislature in Madison, Wisconsin taxpayers are now footing a bill of more than $248 million for school vouchers for the 2016-2017 annual school year. Currently, more than 59,000 children receive vouchers to attend independent charter schools, privately-run/for-profit schools, or, religious schools. (In contrast, approximately 90% of K-12 students attend public schools.) To learn how school vouchers impact public school children, your local property taxes, and, the community’s ability to effectively manage and control their own school district, the public is invited to attend an informational meeting sponsored by the League of Women Voters in partnership with The No Vouchers Coalition. This event will be held on Saturday, May 13, 2017 from 1:00-3:00pm at T.B. Scott Public Library (in the Community Room) in Merrill. Guest Speaker will be Representative Sondy Pope, who serves on the legislature’s Education Committee and as Vice-Chair of the Task Force on Urban Education. 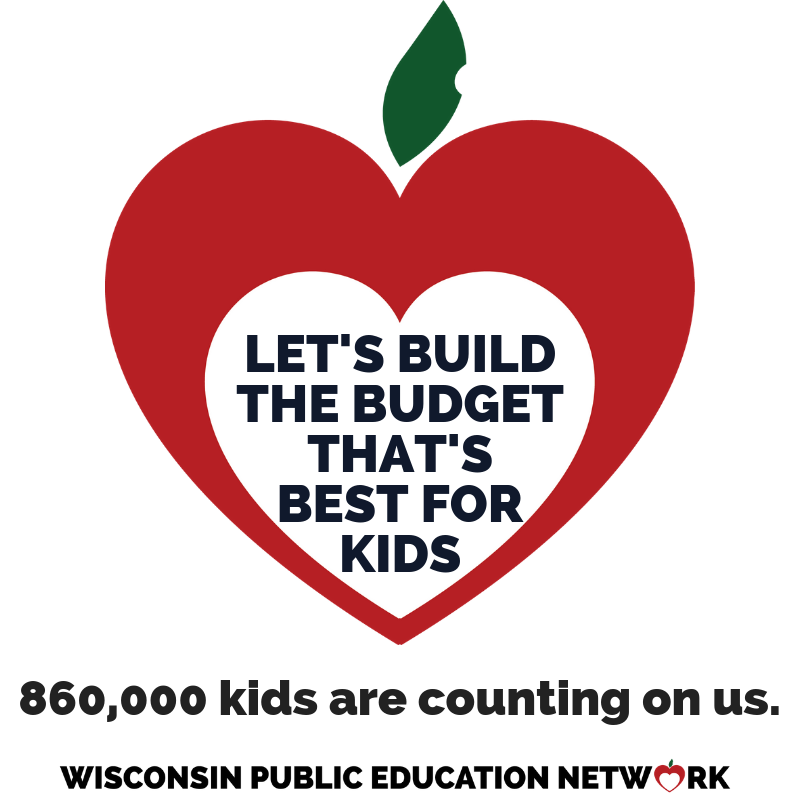 Fri May 12 Wisconsin Public Education Network Meeting, 10am-12pm, Fisher Building (12121 W. North Ave., Wauwatosa). Hosted by SOS-Wauwatosa. Click here to RSVP for May 12 meeting. YOUR VOICE MATTERS! If you are interested in connecting to the regional Budget Action Planning team in your area to participate in JFC Hearing actions and share your concerns about the budget at the hearings and in your community, please contact the coordinator listed for your region here. Fri April 7, Wisconsin Public Education Network Meeting 10am-12pm, Portage County Public Library, Stevens Point. Hosted by School Funding Reform for Wisconsin. Meeting cancelled due to conflict with Berlin JFC Hearing. 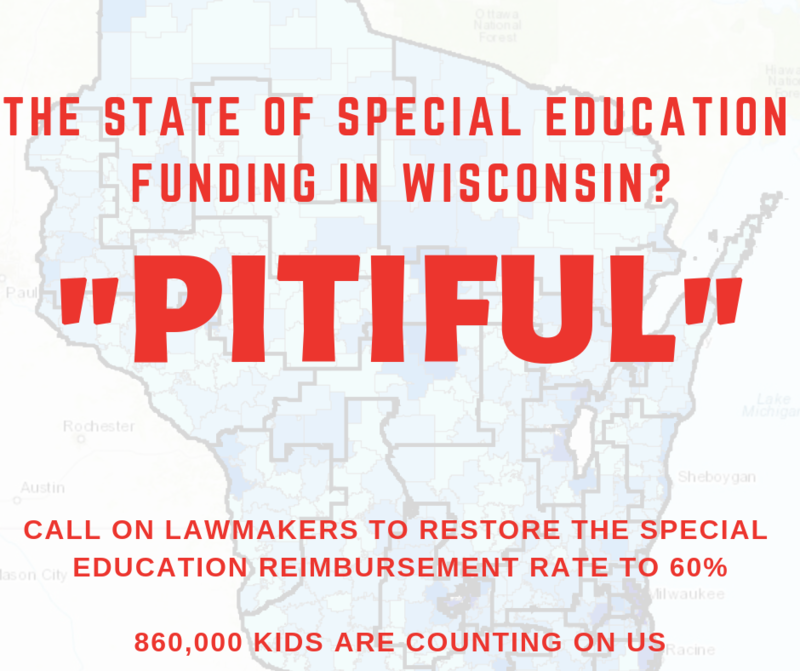 Our apologies to the School Funding Reform for Wisconsin team – we hope we can reschedule a meeting in this region soon! April 6, Active McFarland is sponsoring a talk on “Wisconsin’s Voucher Program: How It’s Affecting Our Public Schools and Our Children” by Jeff Leverich, senior researcher for the Wisconsin Education Association Council. 7:00-8:30 pm. E.D. Locke Public Library, 5920 Milwaukee St. in McFarland. April 4. Spring Election. Polls open 7am to 8pm. Ballots include election of State Superintendent and many school board and referenda questions statewide. Click here to see our Superintendent of Public Instruction Candidate Questionnaire. Click here for sample ballots and voter information: http://MyVote.WI.gov. March 20: SOS Budget Forum. Longfellow Middle School in Wauwatosa from 7 to 9 pm. Jeff Pertl of DPI will present and there will be a panel of education experts (including Wauwatosa Phil Ertl, Chris Thiel and a rep from Women Informed) to take questions from attendees. March 20: Wisconsin’s Voucher Program–What’s it doing to our schools? Dr. Julie Mead. Sponsored by CAPE Middleton. Clark Street Community School, 2429 Clark Street, Middleton. March 16: Wine not Whine, Lyons Irish Pub. Hosted by Watertown CAPS. Join us for an evening of action when we write postcards to our legislators urging them to restore fair funding to public schools. Enjoy the company of other public education advocates as we stand up for our public schools together! Mon March 13 [note date change], Wisconsin Public Education Network Meeting Eau Claire, WI. 1-4 pm. WPEN meeting 1-3 pm (followed by Budget Action & Legislative Advocacy Workshop 3-5 pm), Eau Claire Area School District Administration Building at 500 Main Street. Hosted by ECASD. Click here to RSVP for March 13 meeting. March 9-11: WiLD (Wisconsin Leadership Development) Training, Milwaukee. This 2.5 day training has already been attended by nearly 75 education advocates around the state. Bring your team and connect to an organizing model that focuses on building relationships around shared values to make a local impact that has state-level consequences. These trainings have also provided opportunity for us to strengthen our statewide Network by developing local level teams. Contact Heather at hdb@WisconsinNetwork.org to learn more and get registered. Scholarships available. Budget Action Workshops: Feb 25 (Kaukauna), Feb 26 (Eau Claire), March 4 (Middleton), March 5 (Milwaukee). Please share widely in your teams/communities and register here. Tues. Feb. 28. State Funding, Local Impacts: What You Can Do to Support Sun Prairie Public Schools. Sun Prairie Public Library, 1350 Linnerud. Featuring presentations by DPI’s Tom McCarthy, SPASD Superintendent Dr. Bradford Saron, and Heather DuBois Bourenane of Wisconsin Public Education Network and Support Sun Prairie Schools, followed by audience discussion and Q&A. Feb. 21. Spring Primary Election. Polls open 7am to 8pm. 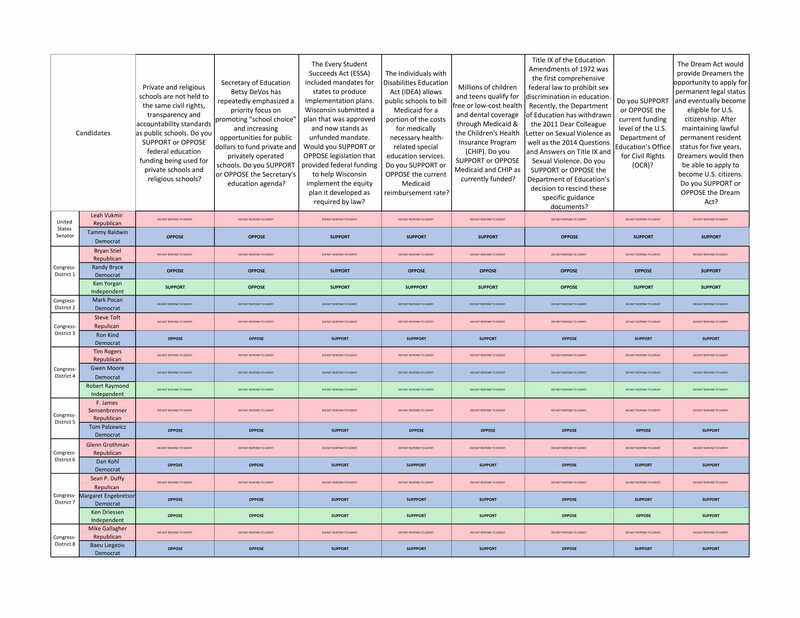 Ballots include the primary for State Superintendent and many school board and referenda questions statewide. Click here to see our Superintendent of Public Instruction Candidate Questionnaire. Click here for sample ballots and voter information: http://MyVote.WI.gov. Thurs, Feb. 16. UW-Madison Professor Julie Mead: “Wiscons in’s Voucher Program: What is it Doing to Public Schools and our Kids?” Sponsored by Active McFarland, Oregon Area Progressives, and Stoughton Dems & Progressives. Time: 7:00 pm; Place: Stoughton High School Cafetorium, 600 Lincoln Ave.
Feb. 13-17, I Love My Public School Week of Action. WPEN encourages local teams and individuals to consider how they can send a positive message of support for local schools to elected officials and decision-makers. Send valentine postcards to your legislators, hold an event, write a letter to the editor, deliver a gift to your school/district office – then am plify the message on social media and by letting us help share your story. Use hashtag #ILoveMyPublicSchool. Please plans/photos/posts to Heather at hdb@WisconsinNetwork.org or tag us on facebook (@WisconsinNetwork) or Twitter (@WiscEdNetwork) – let’s create a blizzard of love for our schools this week! Mon. Feb. 13: Wisconsin Public Education Network meeting. 10am-12pm (followed by 12-1 Capitol visit). Madison – WASB office, 122 West Washington Avenue, Suite 400 . This meeting will be followed by a visit to the Capitol to kick off the Feb. 13-17 I LOVE MY PUBLIC SCHOOL Week of Action. Click here to RSVP for one or both parts of the meeting. NOW-Feb. 10: DEMAND RESTORED FUNDING FOR PUBLIC SCHOOLS! Call for LETTERS & OP-EDs. We are calling on our statwide partners to “be the media” and publish op eds and letters all around the state that put forward a positive, aspirational message about what we expect to see in the 2017-2019 budget to support our schools. New reports indicate that the legislature has $2 billion to work with. Let’s do the right thing and restore funding to our public schools! Our goal is to come out in FRONT of the Governor’s budget proposal by painting a picture of what full and adequate funding looks like where we live. Please share letters/pieces from your group/region with us so we can help amplify your voices. If you have questions about messaging or need a proof-reader, get in touch. Thurs. Feb. 2: Bridging Urban & Rural Education Divides: A Conversation with Katherine Cramer, author of The Politics of Resentment. Dr. Cramer is Director of the Morgridge Center for Public Service and professor of political science at UW-Madison. She’ll sit down with Network partners to talk about what we can do to bridge our gaps. Click here to register. Jan. 30, “Go Public! Why our public schools need our help and what you can do to support them” Heather DuBois Bourenane. 7:00pm, Green Bay, Brown County Central Library Auditorium. Co-sponsored by League of Women Voters of Greater Green Bay and Green Bay Advocates 4 Public Education. Sun Jan 29.“Can Public Education be Saved?” State Superintendent of Public Instruction Dr. Tony Evers on the effects of vouchers and the future of public schools. 4:30 PM, North Shore Presbyterian Church in Shorewood, WI. Hosted by Grassroots Northshore.